When the Pixel 2 and Pixel 2 XL first were released last year, they were full of more bugs than a fruit fly farm. Things were so dicey in the first few weeks after the duo launched that a law firm started advertising for Pixel 2/2 XL buyers to join a class action suit against Google, Huawei and LG. Now, buyers of the recently launched Pixel 3 and Pixel 3 XL are also running into a series of small, but annoying, problems. 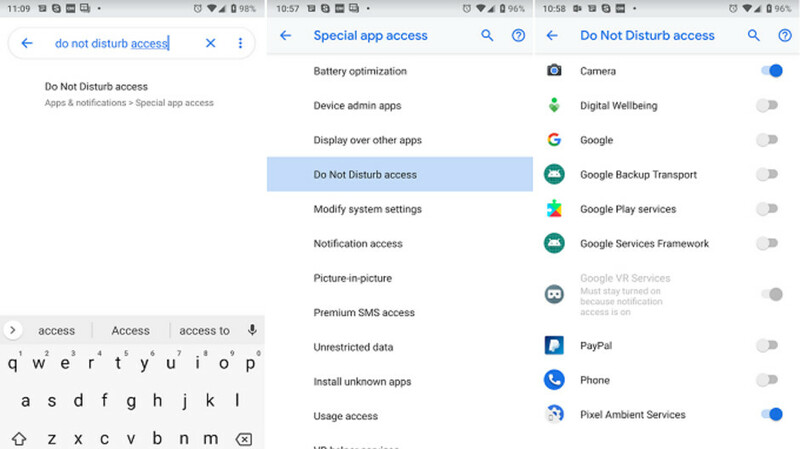 Among these inconvenient issues being navigated by Pixel 3 owners is one mentioned by Twitter user Cloud Strife (@cloudxmm0mmo, through a mention by PiunikaWeb). It appears that while recording a video with his phone (see embedded tweet at the end of this article), the handset received a notification. With the vibration from the notification, the phone shook hard enough to make the resulting video look jumpy at certain times, "killing the stabilization." Because of this, and another problem with the device, Cloud Strife received a replacement unit from Google, but the vibration problem was still affecting the phone. However, there is an easy workaround to fix this. Do a Settings search for Do Not Disturb access and you'll find the apps that are allowed to modify the Do Not Disturb feature. Once the camera is toggled on (like it was by default on our Pixel 2 XL), notifications will not be allowed to disturb your picture or video recording while the camera app is in use. To get to the Do Not Disturb access, go to Settings > Search settings for Do Not Disturb access > Tap Do Not Disturb access > Toggle Camera to on. That is it (see image at the top of this article). No fuss, no muss. No lawyers required. Check out this problem with my Pixel 3 that I received two days ago. If you record video with the pixel 3, it’s already ruined. lol. Google Pixel - the always in beta phone.